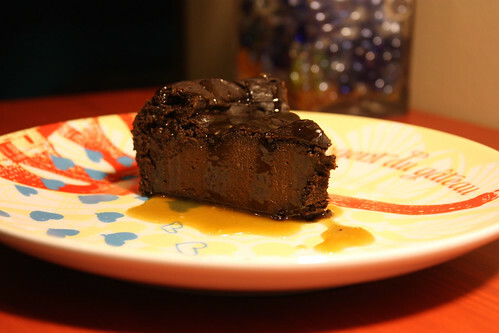 Vegan, Gluten-free… flourless chocolate cake? | Mmm, Tasty! Vegan, Gluten-free… flourless chocolate cake? Making flourless chocolate cake gluten-free is pretty easy, since naturally it’s already gluten-free. But veganizing it takes a bit more work. The usual recipe takes chocolate, eggs, sugar and butter and turns it into a dense, moist, very chocolatey cake. And the eggs in the recipe are what gives it its structure, so you can’t just go and replace them with the usual flax seed, mashed bananas, or ‘vegan egg replacer mix’ that most vegans use in place of eggs. So, how does this work, then? Pumpkin! And also, umm, a little flour. But it’s buckwheat flour, and as the person who wrote this recipe mentions, buckwheat isn’t really flour, it’s a groat! So it doesn’t count, right? The recipe is extremely easy to make: just put everything in a blender and blend blend blend! Then pour into a greased Springform pan and bake for about an hour at 350C. This recipe is from Gluten-Free Goddess, and I didn’t modify it at all, so I’ll simply link to her blog. I will mention that you don’t need a Vitamix for this recipe, any blender will do, as long as it is decently high powered and has about a 2L capacity (or more). I served mine with a simple caramel sauce: Take 2 tablespoons of soy milk and combine them with 1 tablespoon arrowroot flour and 1 teaspoon vanilla extract. Set aside. Then take 1/4 cup of vegan butter (like Earth Balance) and melt in a small pot. Stir in 1 cup brown sugar and 1/3 cup soy milk and let come to a boil. Let it boil for 3 minutes, stirring frequently. Then, take the pan off the heat and stir in the arrowroot mixture – it should thicken pretty quickly. Serve over your cake or over ice cream or anything else that could use a little caramel. This is my final post on the February Vegan Challenge. I have to say, it wasn’t bad at all having zero animal products for the month of February. It was a bit tricky at times, as eating out when you’re vegan can be a challenge, but cooking at home was completely fine. I even finally got to try soy-based ‘sour cream’ and I liked it! Like most vegan ‘replacement foods’ (butter, sour cream, etc) it has to be a sometimes food because of the high amounts of palm oil, but it was a tasty addition to some vegan tacos we had a few weeks ago. If you’ve ever thought of going vegan for a while, I encourage you to do so!